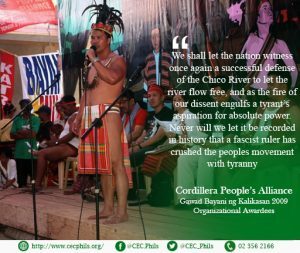 The Cordillera People’s Alliance (CPA) is an independent federation of progressive people’s organizations, most of them grassroots-based organizations among indigenous communities in the Cordillera Region, Philippines. CPA is committed to the promotion and defense of indigenous peoples’ rights, human rights, social justice, and national freedom and democracy. CPA was an organizational awardee of Gawad Bayani ng Kalikasan 2009. These are the names of the persons whose are part of the Department of Justice’s (DOJ) terror list: Victoria Tauli Corpuz, current United Nations Special Rapporteur on the Rights of Indigenous Peoples, former Chairperson of the UN Permanent Forum on Indigenous Peoples and former Secretary General of the Cordillera People’s Alliance (CPA); Beverly Longid, current global coordinator of the International Indigenous Peoples Movement for Self-Determination and Liberation (IPMSDL), former CPA Chair and current Advisory Council member; Atty. Jose Molintas, former Asia representative to the UN Expert Mechanism on the Rights of Indigenous Peoples (EMRIP), former CPA Chair and current Advisory Council member; Joanna Cariño, member of the CPA Advisory Council and Co-Chair of the SANDUGO Movement of Moro and Indigenous Peoples for Self Determination; Windel Bolinget, current Chairperson of the CPA and National Co-convenor of KATRIBU National Alliance of Indigenous Peoples in the Philippines; and Jeanette Ribaya-Cawiding, former Chairperson of CPA-Tongtongan ti Umili and current Regional Coordinator of the Alliance of Concerned Teachers – Cordillera. The inclusion of the names of the members of CPA in the “terror list” is an attempt to repress the people’s struggles for their rights. Despite these attacks, the organization continues to stand against so-called development projects that affect the environment and their ancestral domains. The Cordillera People’s Alliance (CPA) up to this day still perseveres to battle the issues regarding with: Duterte’s ‘Shoot NPAs’ Order; Condemnation of fascism of the 7th Infantry Division; PNP’s harassment on CPA; Large-scale mining in the Cordillera Region; Duterte’s approval of Chico River Pump Irrigation Project.